Frozen 2 Trailer Tells Us Nothing, Is Still Awesome | Nerd Much? Disney’s Frozen took the world by (ice) storm when it hit theaters in November 2013. On a budget of $150 million, the animated feature raked in over $1.276 billion. That’s what you call a success. Disney was publicly adamant about not forcing a sequel, but one was eventually announced in March of 2015. And now four years later, we have our first Frozen 2 trailer. The creators of the original Frozen, Chris Buck and Jennifer Lee, are back at the helm of Frozen 2. All the principle players return in Kristen Bell (Anna), Idina Menzel (Elsa), Jonathan Groff (Kristoff) and Josh Gad (Olaf). And big name like Evan Rachel Wood and Sterling K. Brown have reportedly joined the cast too. But what we don’t know is pretty much anything else. Disney hasn’t said much as to what the story for the sequel will be. And the Frozen 2 trailer, while exciting, tells us next to nothing. In fact, there’s not a single line of dialogue in the entire thing. It begins with Elsa standing on a beach at night. She makes several attempts to run atop the ocean water and make it past the roaring breakers, with the segment concluding with her failing and falling into the water. We then cut to Anna who throws open her bedroom window at night to find hundreds of rhombus shaped foreign objects floating in the air. We then quickly go to Kristoff racing through the woods atop Sven. The camera then pulls back to reveal that dozens of over reindeer are running along with them. We then go back to a dismayed Anna who appears to be trapped alone within a cavern of some sort. And then comes a shot of Elsa and Olaf surrounded by mysterious pink flames which Elsa is attempting to keep at bay. There’s then a quick portion of the Frozen 2 trailer that looks as though it features Anna and Kristoff, but the duo look considerably younger in the fleeting glimpse. There’s some sort of magical force at work here, as a bunch of fallen leaves pick Kristoff off of the ground and lift him high into the air. 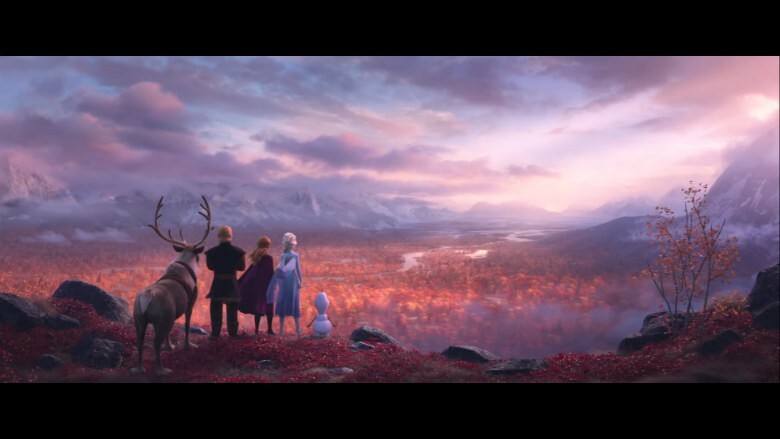 These leaves in the Frozen 2 trailer look to hint at the wider scope of things, as the footage closes out with the core group staring out across a vast area covered in fall foliage. We then get the Frozen 2 title card, with an orange-red leaf blowing in to cement its significance. Officially from Disney, all we have is a description that suggests the sequel will revolve around “Elsa learning to channel her powers as she and Anna work with Kristoff and Olaf to learn more about the mystery of their kingdom.” So yeah, next to nothing. Hopefully we’ll get more from the studio soon so we can better theorize what’s taking place in this mysterious Frozen 2 trailer. The movie hits theaters on November 22nd. Until then, checkout our site’s coverage of all the upcoming animated movies joining the Frozen sequel on the 2019 slate and beyond.